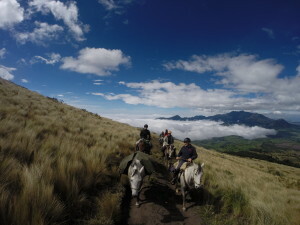 We begin our expedition at Hacienda La Alegria – a family-run horse and organic dairy farm located in the heart of Ecuador’s magnificent, Volcano Avenue. The Hacienda sits on 135 hectares, nestled in the fertile valley of Machachi, near the small village of Aloag. Built a century ago, the Hacienda has retained its stately elegance and original character, as well as its exquisite surrounding gardens awash with colorful roses, native flowers, graceful trees and intricate outdoor stone work. Filled with historic charm, the Hacienda’s large rooms are filled with antiques that have been in the Espinosa family for hundreds of years. To reach the Hacienda, one drives along a cobblestone road originally built by the Spaniards and Incas, lined with tall, majestic Cedars, Eucalyptus and Cypress trees and lush greenery. 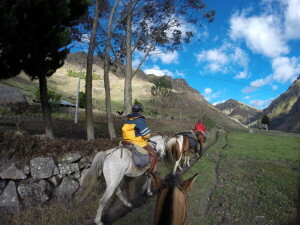 Hacienda La Alegria’s mission is to provide the finest eco-tourism adventures and horseback riding in the country. We offer a warm and inviting atmosphere in our historic Hacienda, and provide the personal attention needed to make you feel like family. Our horses are exceptional; we breed our own horses and their ancestors are Berber (local horse), Andalusian and Arabian breeds. The Ecuadorian Andes run north to south and are comprised of eastern and western chains. Hacienda La Alegria is at the western chain. 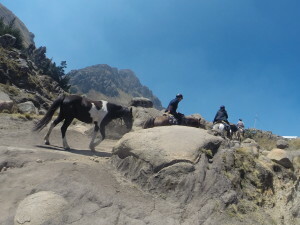 The southwestern Andes are a well known Indian region, isolated communities like, Quilotoa, Sigchos and Guambaine are discovered in the middle of the Andes, following the same traditions and ways of life since the Colonial times. This ride is specifically designed for those looking for cultural immersion and adventure with long journeys and amazing scenery. 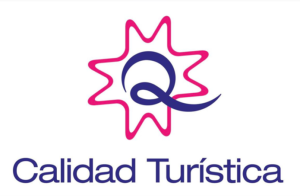 The route takes us close to the Illinizas, Quilotoa, Chimborazo, Carihuirazo, Igualata and Tungurahua volcanoes, the last of which has been active for the last 16 years. During the ride we also have the opportunity to enjoy two thermal springs. Over the first days, riders will have the opportunity to acclimatize to the altitude, weather and new environment. Riders will get to know the horses well and start a relationship with them, as they will be part of the team for the rest of the ride. They will have the opportunity to try a variety of horses with different temperaments and traits; together we will choose which group of horses will accompany us, as we will have several spare horses on the ride. 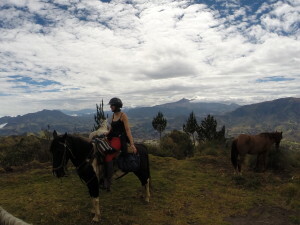 Arrive to Airport and transfer (one hour) to Hacienda La Alegria (2,890 m). Spend the night at Hacienda La Alegria, if your arrival is on time we can have a first day ride. In the morning after breakfast, we will try the horses and ride in a closed arena until you feel comfortable with your horse and tack. Day 2 ride is acclimatization around the hacienda. You will see the green valley of Machachi and the soaring mountains of the Volcano Avenue, where we will be riding during the trip. Arrive for a late lunch, and an afternoon tour of our farming operations. Spend the night in Hacienda La Alegria. 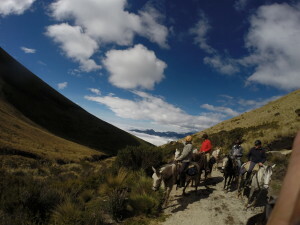 In the morning we ride west towards the Corazon to 4,000 meters and descend to the cloud forest. 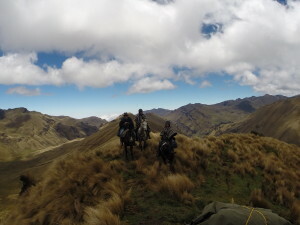 We ride by 3 different ecosystems as the valley, paramo and arriving to cloud forest. At the cloud forest, we can observe a great biodiversity of plants and flowers, including giant guneras, orchids, and birds such as the turkey of the forest (guan). In the afternoon, we arrive for tea at Hacienda Bomboli (3,000 m), relax by the fireplace, enjoying the sunset, and watch the lights of the villages near the coast following a great meal. Delicious dinner at the Hacienda. This second part has long journey on the saddle. We start the ride one hour south of Hacienda la Alegria, we will be transfer by car to this point to start our 6 day adventure at the southern Andes. Today we will ride by the Inca trail and dirt roads and paths that takes us to Sigchos, the village that was known as the “last home” of the Inca general Ruminahui. 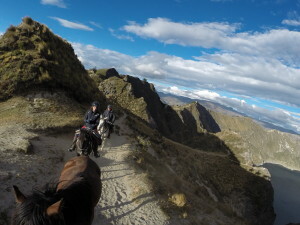 From this day on we will ride through a dramatic landscape, including steep ravines and narrow passages. Even though we can visualize where we are heading and it looks near, we will have to cross many mountains chains to get there. This area is a combination of forest, rock peaks and eroded land from the last centuries. We arrive at the Hacienda San Jose, a working dairy farm and guest house. In time for a good meal, Jacuzzi, sauna and rest. 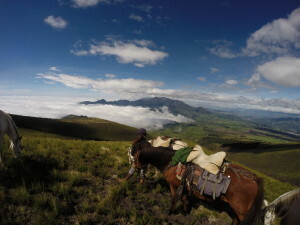 Our horses will be have lush fields of fresh grass, the last for the remainder of the expedition. After breakfast we head south to the Quilotoa crater lake. The trail goes by the bottom of the Toachi canyon, were we will have lunch. There are few agricultural villages and houses, and the land is very dry and the soil is composed by pumice from the Quilotoa volcano that erupted 1,280 years ago. The challenge will be to get to the Quilotoa summit at 3,800 meters above sea level, where our hostal is awaiting. 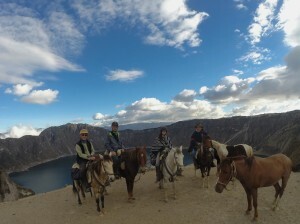 At the cliff of the volcano we will enjoy and amazing view of the breathtaking Quilotoa crater lake. 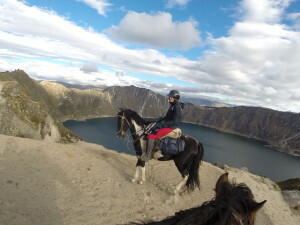 Quilotoa is a crater lake caldera and the most western volcano in the Ecuadorian Andes. The 3 kilometer wide caldera was formed by the collapse of this dacite volcano following a catastrophic eruption. 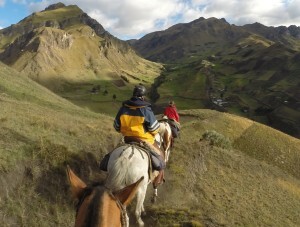 Zumbahua is the next village at which we will start the trekking to the high Andes. We then find a small isolated homestead of about 50 families, there are no roads and the only connection to civilization is by a 3 hour path to Angamarca. We will see llama herds that are used as pack animals as well as sheep guided by children working as shepherds . This day will be an intense riding day and will be climax of the adventure. We will be the first tourists arriving to the area, camping overnight and using one of the grass huts for a kitchen. We are looking forward to help the community to make a path to the east that will help the locals sell their products at a larger market and also to get better prices on their products of cheese, potatoes, broad beans and barley. Early morning we will have the opportunity to admire the extraordinary combination of the sunrise and the clouds arriving from the west cloud forest. 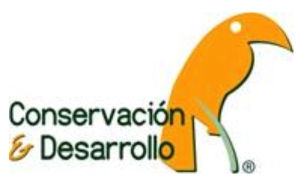 We will encounter a dramatic change of the ecosystem “paramo”. 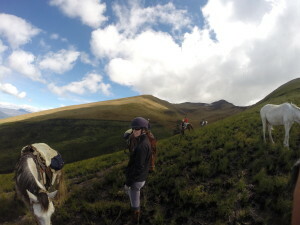 Riding from the high mountains to the lowland valleys (3700 mts), we will see thousands of small farms, a lot of them produce milk (50% of the milk produced in Ecuador is from farms that have less than 5 acres). We will admire a ravine that originates from the Chimborazo volcano (6,300 meters, highest volcano in Ecuador), along the ravine’s river runs an old road built in 1830’s called “camino de Flores”, being the first road to connect the highlands with the coast. In the afternoon we will arrive to a hot springs where we will set up the camp and enjoy a nice BBQ dinner. Carihuairazo is a volcanic caldera adjacent to Ecuador’s highest mountain Chimborazo. Located: 40 km NW of Riobamba and 22 Km. SW of Ambato. Chimborazo is a currently inactive stratovolcano in the Cordillera Occidental range of the Andes. Its last known eruption is believed to have occurred around 550 AD. 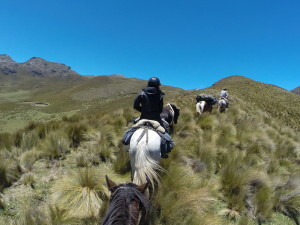 The expedition continues all day along the Chimborazo skirt; will be a challenging ride with many different sceneries as dry hills, swampy areas and rocky hills. We will ride east, crossing into the eastern Andes mountain chain. Last day of our expedition will be the Tungurahua area that has been affected over the last 14 years with volcanic ash and periodic eruptions. This ride completes our journey through the east. We ride by fertile hills with potatoes, beans and cash crops, on side of the Igualata volcano. The landscape is dotted with mini-farms up to 4000 meters high. We start the downhill to the Chambo canon and arriving to the Tungurahua volcano skirts, the volcano and the changes of the scenery from 4000 meters to 2400 mts. high makes and impressive scenery. 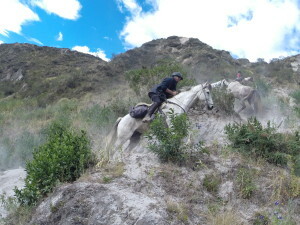 Our horses will go back to the hacienda and we drive 15 km to Banos, were we overnigth . Visit Banos that is based on the skirts of the Volcano, a very unique city that is the entrance to amazon jungle region and well know about the thermal water springs and several adventure activities.